New Research or Dubious Science? Reprinted with permission, Center for Science in the Public Interest. But, tempting as it may be, is it prudent to push aside prevailing counsel and order that steak with buttered potatoes? Science not only asks the question; it provides the answer. Public health officials and health-promoting organizations have long categorized saturated fats as “bad” fats because of their documented harmful effects on the heart, and unsaturated fats as “good” fats because of their positive effects on the same organ. 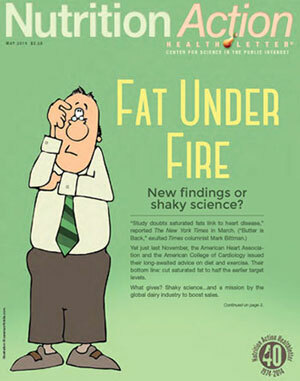 It was, therefore, little surprise that when Rajiv Chowdhury, M.D., Ph.D., and his cohort questioned conventional wisdom and long-standing dietary recommendations to avoid foods containing saturated fats (e.g., beef, cheese and butter) and replace them with more foods containing unsaturated fats (e.g., nuts, vegetable oils and salmon), a faction ensued. Meanwhile, as pundits, physicians and policymakers pontificated, the American public watched, read and waited, wondering whom to believe and what, if anything, to do. 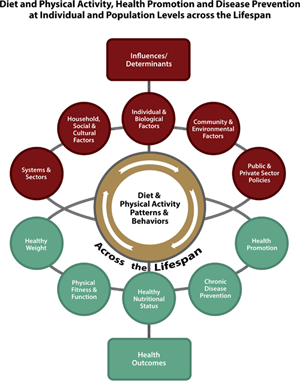 About half of American adults, or 117 million people, have one or more preventable chronic diseases related to poor diet and lack of physical activity, and about two-thirds, or 155 million of the same demographic, are overweight or obese. Guided by these facts, in February 2015, the nation’s top scientific panel on nutrition released an update on healthy nutrition and provided food-based recommendations that emphasize higher consumption of vegetables and fruits, and lower consumption of red and processed meat. The recommendations are the scientific basis of the Dietary Guidelines for Americans, which is updated and published every five years by the U.S. Department of Agriculture (USDA) and the U.S. Department of Health and Human Services (DHHS), and which influences federal food and nutrition policy, as well as education initiatives such as the school lunch program. If heeded, these latest recommendations mean a significant diet shift for many Americans. They also offer some help for the environment, as the panel placed a premium on sustainability and environmental impact during its review, a new provision that acknowledges a connection between the physical well-being of humans and the health, and future, of the planet.